Will you still be making compilation tapes for your mates when you’re almost 50? I only ask because that’s what Paul Weller does. After I last interviewed him, he sent me a mix of old soul and Mod numbers. He’s also a big fan of new music, some that I’ve heard of – Amy Winehouse, Lily Allen, The View – and some I very much have not. Today, for example, he’s brought me a CD by cult young British outfit Tunng that he thinks I’ll like. How does he feel about reaching the half century? ‘It’s just wrong,’ he says, smiling dolefully. It is easy to see why this man is revered as one of the coolest men on the planet. While Weller has been described as a punk, a soul boy, a pin-up for dad-rock and laddism, throughout it all he has been, first and foremost, a Mod. Looking sharp is all important to Mods – it’s almost a religion to devotees – and for more than three decades Weller has been a style icon. Recently returned from a family holiday in the Caribbean – which explains the healthy walnut veneer on his angular face – Weller looks the part. Over a sausage sandwich and a cup of coffee in a cafÈ near his home in trendy Maida Vale, north London, he is expounding on his latest style. His outfit is particularly honed – pointed Bottega Veneta shoes (‘mega-expensive but top shoes’), blue-and-brown checked Prada trousers (‘it’s a houndstooth thing; no matching jacket, unfortunately’), and green Margaret Howell jumper. Weller obviously has an eye for Italian design classics. The previous day I’d met up with him and Noel Gallagher, and Weller was quick to borrow his friend’s new scooter. ‘It’s a 1969 Lambretta SX200,’ says Weller today. ‘Perfect nick ’n’ all. Although, if I’m honest, I’m not sure how much he rides it. The Modfather loved Gallagher’s Lambretta so much he couldn’t resist hopping on... and he hasn’t been without it since, even riding it to and posing on it for Live’s shoot today. Weller is, of course, a music icon. His three decades of performing kicked off in 1977. His band the Jam went on to score 18 Top 40 singles –including four No 1s – in five years. The Style Council came next, giving him continued chart success and helping him break America. With his solo career still buoyant (eight solo albums, a Brit Award for lifetime achievement and regular sell-out arena tours), Weller is effectively on his third act – and showing no signs of slowing down. This passion and drive is the reason he is here today. And so it was that Ben Sherman approached him to collaborate with them on the design of a new shirt. Well, a new old shirt. The initial inspiration was a vintage Ben Sherman given to Weller by Steve Ellis, singer with cult Sixties pop/R&B outfit Love Affair. ‘I wore it at Glastonbury in ’94. A proper Sixties one, beautiful – turquoise with chocolate-brown stripes. I based my designs on that – big candy-coloured stripes and a bigger, fuller collar. It’s got all the little details – the pleat and the little hook at the back, square along the bottom.’ He still has the shirt. Little wonder, then, that fashion companies are keen to co-opt his talent. The hook-up with Ben Sherman follows previous collaborations with shoemakers Hudson, for whom he came up with a basket-weave shoe, ‘which really took off. He was also involved with another British clothing classic, Fred Perry. ‘I went through their archives to try to find the same kind of weave they used 35, 40 years ago. I wanted to make the collar a little wider and have more of a roll – all the little details that they lost along the way. One day, I’d like to do my own line – if I could use someone else’s money. I’m talking with someone at the moment about maybe doing a little range next year. Weller bonds with Noel Gallagher over their love of music rather than clothes, and they spent a lot of time together recently rehearsing at Wheeler End, Oasis’s Buckinghamshire studio, gearing up for their spot at the Teenage Cancer Trust gigs at the Royal Albert Hall. At the previous day’s shoot, the two fell into the kind of quick-and-ready ribbing close male friends indulge in. 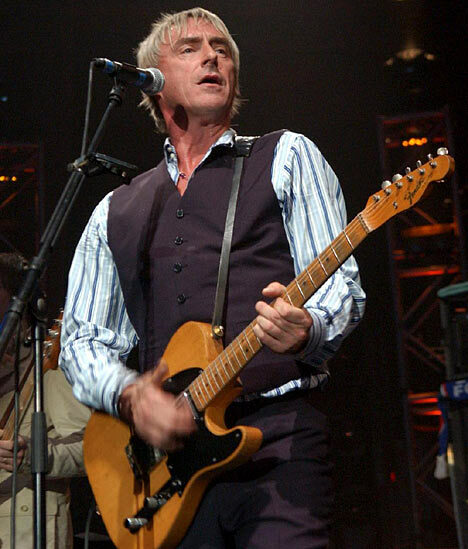 Weller had launched an attack on Oasis for their lack of stage presence. ‘Why can’t you lot dance around a bit, rather than just stand there?’ he said. ‘We can’t jump about like a lunatic like you,’ replied Noel, then he asked Weller for a demonstration. But for all their sniping at one another, Weller is the only person whose advice the notoriously self-assured Gallagher will listen to. ‘Weller voices his opinion a lot – a bit too much for my liking,’ Gallagher said, while Weller was in front of the camera. ‘But he’s an honorary member of this band. When you’re around him you can see why he’s a solo artist – because he’s intense and pursues perfection. I love him to bits. He’s a friend first and foremost, my oldest friend since I moved to London. Spend any time with Weller and you’ll be beset with opinions. He comes from the generation of pop stars that took on the Tory government of Margaret Thatcher in the Eighties and he is still passionate about politics. ‘I performed at an anti-Iraq-war gig before the 2003 invasion and I’m disgusted at our role in the continuation of the mess in the Middle East. Meanwhile, hospitals aren’t getting any better. I don’t know where all our taxes go to – it certainly isn’t into any welfare system or schools. He shakes his head, takes a slurp of coffee and is on again about his first passion – music. One of his daughters has just played him Kelis’s single Millionaire. He loved it but is withering about modern American R&B albums. ‘There are always one or two great tracks and the rest is just padding, making up the numbers. BeyoncÈ – two great tracks on that record, the rest is all bland ballads. I was at the Q Awards last autumn and the most influential act in the world or something was Take That! Indeed, the recent trend for outfits to reform only fills him with anger. ‘I’m not into it at all. I think it’s rubbish. It’s cabaret. I don’t want to get involved in it. Weller rises to pay the waitress and buttons up his elegant Dolce & Gabbana pea coat. He is a man for whom passion and integrity are his trusted touchstones. ‘When I go on tour, I take cases full of suits and scarves and shirts – all smart gear,’ he says. ‘A few weeks back, I was in the Oasis dressing room before a big show and they were all standing there waiting to go on wearing the same clothes they’d been in all day.